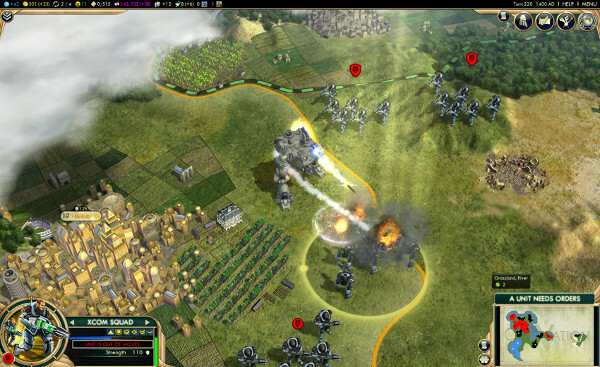 Firaxis Games is mixing a little XCOM: Enemy Unknown into their other strategy game Civilization V. The upcoming Civ V expansion Brave New World will allow players to add XCOM troopers to their civilization's army. At PAX East, the studio confirmed that these XCOM squads are a unit type unlocked late in the game. They function as paratroopers, meaning that they can travel great distances in a single turn. Their Skyranger air transport allows them to move 40 units. Brave New World was announced last week. The expansion provides American Civil War and African colonization scenarios for players to tackle. It also introduces nine new civilizations and eight new wonders. Players will now be able to win the game by creating a dominant culture. During their panel, Firaxis confirmed release dates for Brave New World. The expansion will debut in North America on July 9th. The game will spread elsewhere on July 12th. The new Civ units aren't the only XCOM news to come out of PAX East. Firaxis has also announced an iOS version of the game.